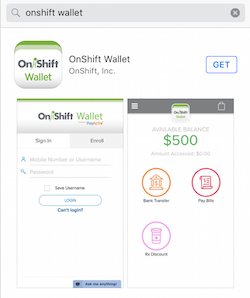 The OnShift Wallet app may be downloaded via iTunes or Google Play. The OnShift Wallet Visa Prepaid Card is an enhancement to the OnShift Wallet app, made possible through a partnership with employee financial wellness software company PayActiv. The prepaid card allows employees to check their account balances and manage their accounts through the OnShift Wallet app anytime, anywhere. Employees can access their funds, including their standard paychecks and potentially their earned but unpaid wages, in real time. There are no fees to enroll or to withdraw cash at any MoneyPass ATM in the United States.